KABUL, Afghanistan — From a dusty village in central Afghanistan, where life depends on the almond harvest, Najiba Hussaini made it far. Graduating at the top of her high school class, she won a scholarship to earn a degree in computer applications in India, and she went on to the port city of Kobe in Japan to receive a master’s degree in information systems. Last fall, Ms. Hussaini, 28, returned to lead the database unit at Afghanistan’s mining ministry, developing applications to digitize an old bureaucracy that is crucial to the country’s economic future. Her life and dreams were cut short on Monday morning as she was making her way to work. 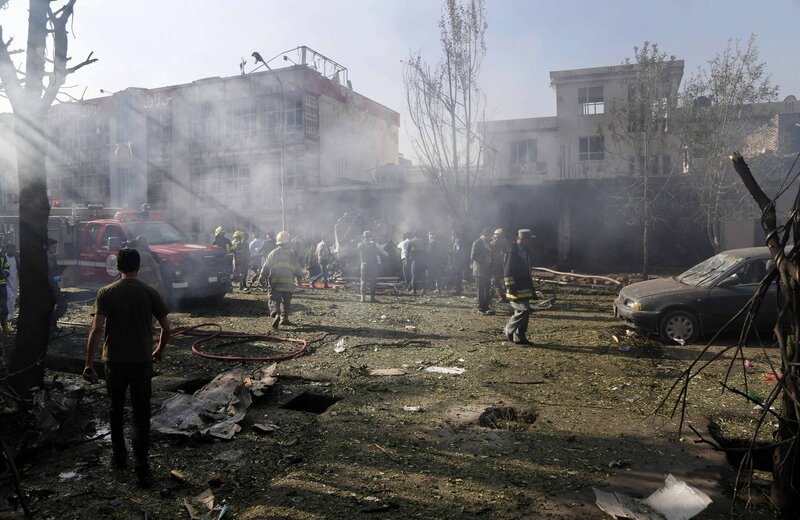 A Taliban suicide bomber detonated a vehicle full of explosives in western Kabul, killing at least 24 people and wounding another 42, according to Najib Danish, a spokesman for the Afghan Interior Ministry. Another senior security official put the number of dead at 38. As has become routine after such large blasts in Kabul, family members searched for hours for news of loved ones, going from hospital to hospital. Many of the bodies, including Ms. Hussaini’s, were badly burned. “We identified her from her ring — silver, with a turquoise-colored stone,” said Hussain Rezai, who was to be formally engaged to Ms. Hussaini within weeks. He said he had already traveled to Shahristan District, in Daikundi, to seek the approval of Ms. Hussaini’s parents. Preparations for the engagement were in place, and the couple expected to go to Daikundi in a few weeks and make the engagement official. Instead, Ms. Hussaini’s charred body, tied to the top of a small van, set off on the treacherous 18-hour journey from Kabul to Shahristan. The vehicle, with Mr. Rezai and Ms. Hussaini’s other loved ones on board, was to travel all night, making its way on dirt roads through patches of Taliban country. The United Nations says there have been more than 1,000 casualties, including about 220 deaths, in Kabul in the first six months of this year, an increase of more than 25 percent compared with the same period in 2016. Most of the casualties were caused by suicide bombings in crowded areas, often in neighborhoods saturated with government and private offices. “The detonation of another large suicide device in a busy, civilian-populated area is egregious, cowardly and bereft of humanity,” said Pernille Kardel, the United Nations secretary general’s deputy special representative for Afghanistan. While Afghan civilians in the countryside have suffered for years, the intensity of the violence in Kabul, the capital, this year is taking an unusual toll on young and educated Afghans. The attacks not only shatter lives largely built on the past decade’s opportunities, but also exacerbate a sense of hopelessness here that has driven many young Afghans to join an exodus to Europe. Most of the people killed or wounded in the bombing on Monday worked for the Afghan Ministry of Mines and Petroleum and were commuting in a minibus from western Kabul. Others were also civilians, including Khala Aziza, a cook at a local orphanage who had five children, now orphans themselves. A list of the ministry victims broadcast by local news organizations showed that 13 had bachelor’s degrees, in subjects including chemical technology and mineral geology. Two of the victims, including Ms. Hussaini, had master’s degrees. Ms. Hussaini grew up in one of the most deprived places in central Afghanistan. Her father runs a small grocery shop in the main bazaar in Shahristan. Her mother baked bread for the nearby seminary, and Ms. Hussaini would deliver loaves. After graduating, Ms. Hussaini went to Hyderabad, India, in 2008 to start her college studies. There, her classmates said she struggled with English at first, stymied by even basic conversations. Jawad Kankash, one of her classmates in India, recalled how Ms. Hussaini had cared for a friend who had been hospitalized, and left her bedside to go home and cook food for her. On her way back with the food, Ms. Hussaini struggled to communicate directions to the driver, and she ended up at the wrong hospital. By the time she found her way to the right one, she was caught in a confusing fight with the driver over the high fare. Ms. Hussaini returned to Afghanistan to work at the mining ministry, which then sent her to Japan for graduate studies at the Kobe Institute of Computing. Her classmates there said her English improved so much that she helped others cope with language difficulties as well as homesickness. Hours after her death, a picture of her receiving her master’s degree circulated on social media. Dressed formally, she displays her red, bound diploma with a smile of accomplishment. “She was a hard-working girl,” said Shafiqa Pooya, who got to know her while also studying in Japan. “Her parents are old, and she was the breadwinner. As Ms. Hussaini’s parents remained in Daikundi, friends said, she lived in western Kabul in a rented house with her two brothers and a sister. All three of her siblings had come from Daikundi for university studies with her financial support. The funeral van to return Ms. Hussaini’s body to Shahristan was delayed after her sister fainted in grief and had to be brought to a doctor. Eventually, Ms. Hussaini’s wooden coffin, draped in green velvet, was secured to the top of the van. She, and those who mourned her, set off for the small village where it all began.